By Rachel Kashdan·	 3/22/2019, 12:42 p.m.
Kristina Tsipouras and Dan Miller met on a dating app—twice. They first matched on Tinder and began chatting, but life was busy, the pair says, and nothing ever came of their interaction. A year later, they matched again, this time on Hinge. “I think I initially reached out and said, ‘Hey, I remember we used to talk,’” Kristina says. 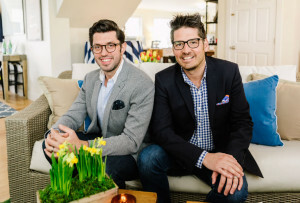 For their first date they went to Tommy Doyle’s, a pub in Newton, and hit it off. Until 9 p.m., that is, when Dan had to rush out. “I’d recently had a flood in my basement, so I had to cut the date short because I had a contractor coming over,” he says. “She thought it was an excuse and that I didn’t want to see her again.” Dan did, in fact, want to see her again, and the pair went on to date for more than two years, eventually moving in together in that same house. “And yes, we do have a basement that floods,” Kristina says with a laugh. One night in June 2017, Dan told Kristina that they were going to dinner with his sister and her husband downtown, so she started getting ready for the evening. Her hair was half-curled when Dan, who plays guitar in a rock band, told her he was working on a song and wanted her to hear it. She went upstairs, and Dan started to sing the song he’d written. “It was about my love for her and all of the amazing things about her,” Dan says. The song ended with Dan singing that he had a question for her, at which point he got down on one knee and proposed. “I was very shocked,” Kristina remembers. 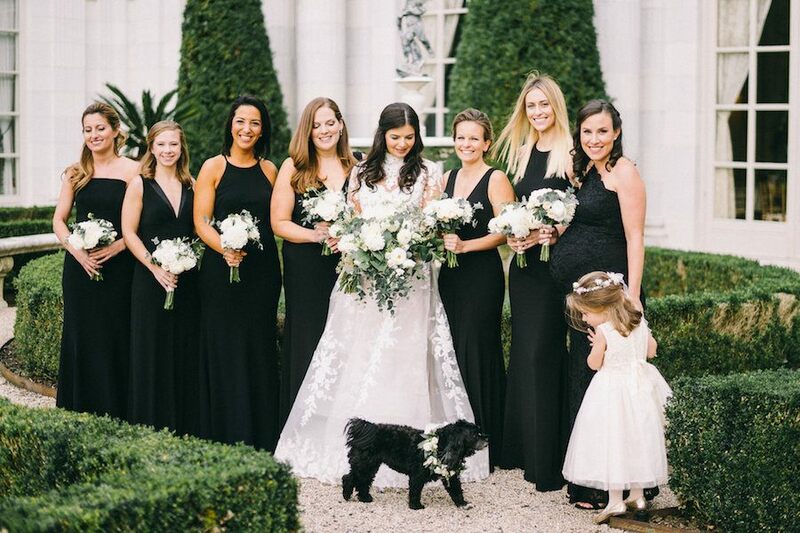 Kristina, a former wedding planner turned entrepreneur and influencer who goes by the moniker Busy Girl Boston, says she knew exactly what kind of wedding she wanted. 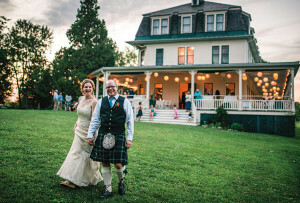 A key part of the couple’s vision was Newport, where Kristina had spent summers growing up, and where she and Dan took many day trips throughout their relationship. “It was kind of our spot,” Dan says. They visited several venues there but, in the end, none competed with Rosecliff, a Gilded Age mansion located on Newport’s Cliff Walk. 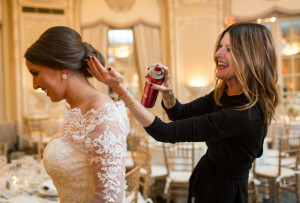 “Dan knew as soon as I walked into Rosecliff and he saw my eyes that there was no turning back really,” Kristina says. The bride instantly fell in love with the “fairytale” feel of the venue, she says, and quickly got Dan on board. 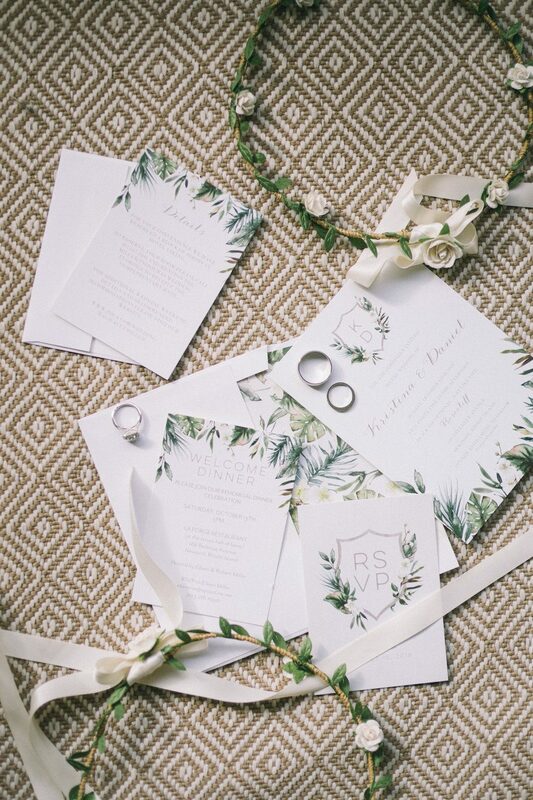 “It definitely has that wow factor,” the groom says. 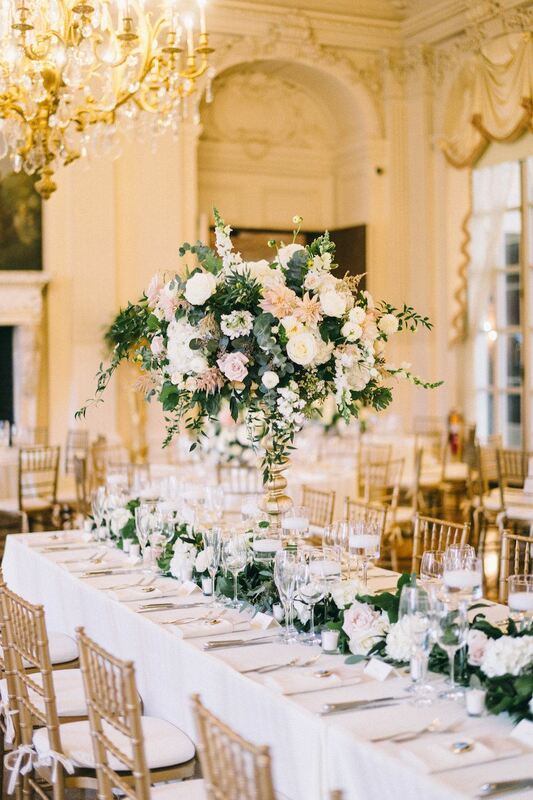 The couple dressed up the space with pale pink and white hydrangea, roses, and dahlias and décor that would lend a romantic feel such as candles and touches of gold. They also incorporated livelier elements such as a passed-plate dinner and songs by Nirvana. “My friends have always said my taste is very classic and Jackie O-esque, but that my personality is more rock and roll, so we wanted those sophisticated, elegant [touches] but also wanted it to feel really comfortable,” Kristina says. On the warm autumn evening, the couple and their 150 guests partied on the dance floor long into the night. “We had a dessert room with coffee and tea that was sort of quieter, which our parents were happy about, but we didn’t end up seeing it the entire wedding. I heard it was beautiful though,” the bride says with a laugh. “We were pretty much dancing the entire time,” Dan adds. 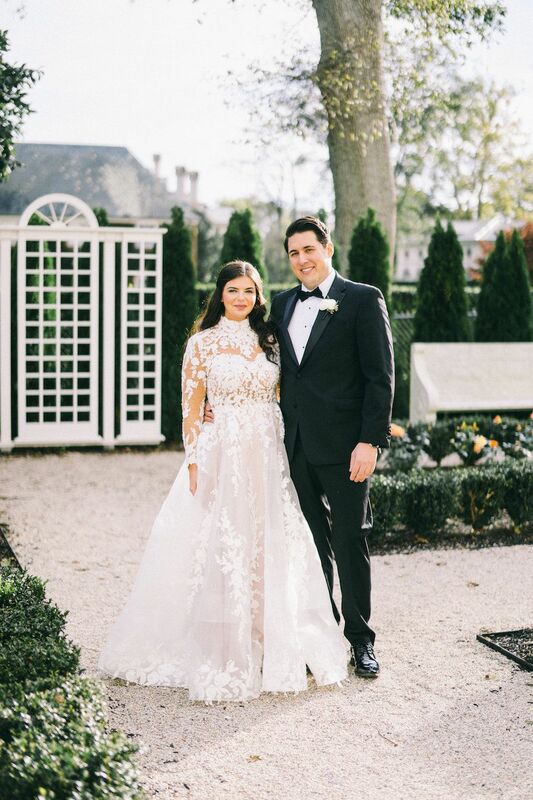 For her ceremony, Kristina wore a high-neck, long-sleeve illusion dress that she designed with the online custom-dress startup Anomalie. 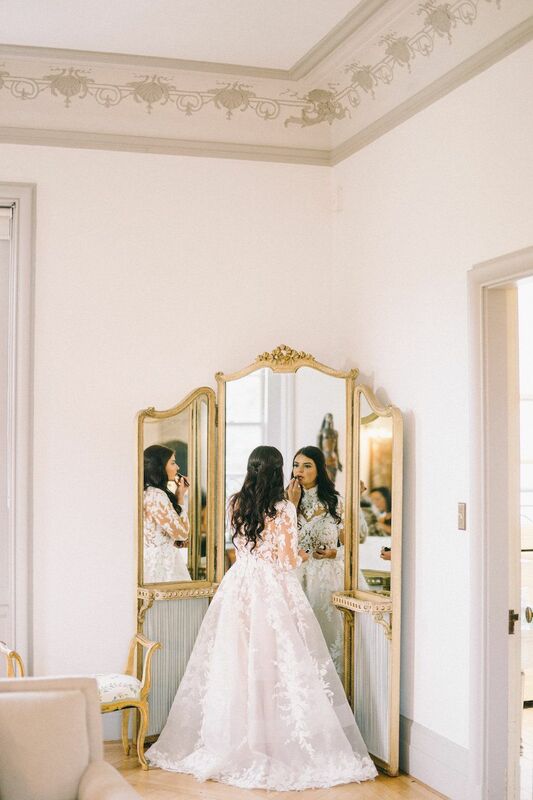 “It was the most beautiful dress I’ve ever seen,” the groom says. Later, for the reception, Kristina changed into a strapless beaded gown purchased at Your Dream Bridal. 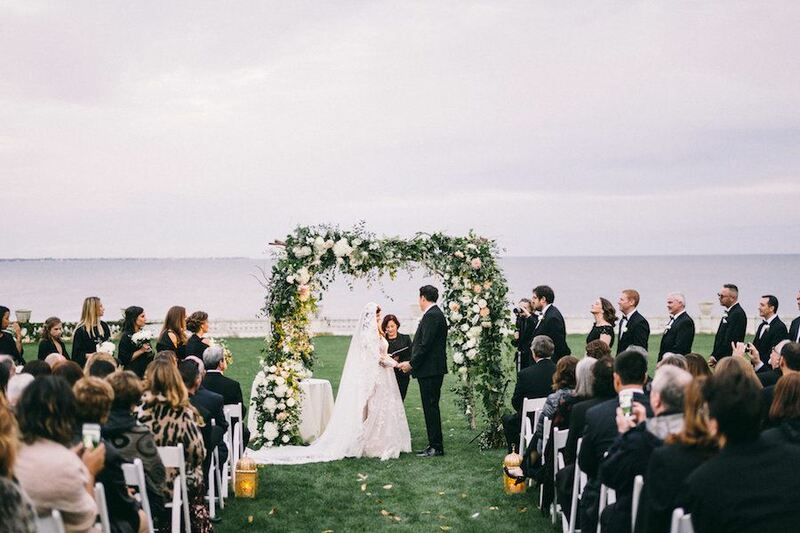 At sunset, the couple tied the knot on the mansion’s oceanfront lawn. “The sky was completely lit up with pinks and purples and everything was perfectly still and so peaceful,” Kristina says. Dotted with white votives, Kristina and Dan’s tablescapes featured free-flowing arrangements of hydrangeas, roses, dahlias, snapdragons, ranunculus, and eucalyptus. “That ballroom is so gorgeous that I didn’t want to do too much to take away from that,” Kristina says. 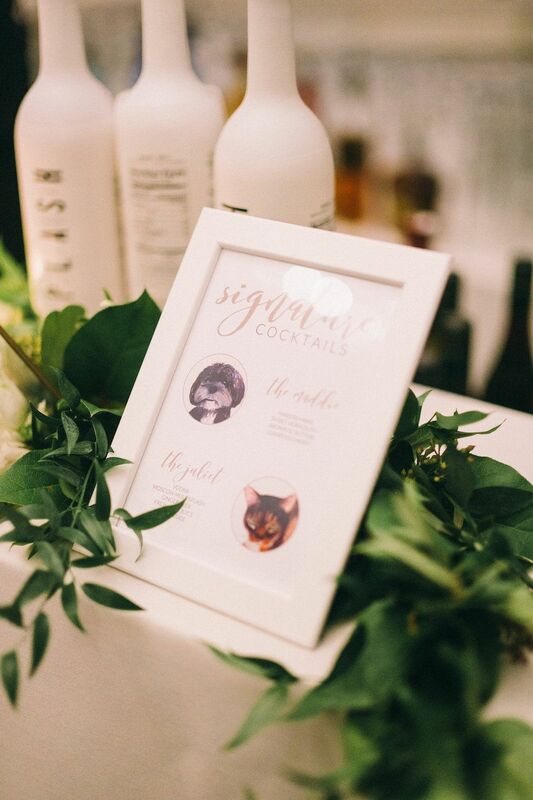 The bartenders served two signature drinks at the couple’s reception: “The Maddie,” named after the couple’s dog, with Maker’s Mark, vermouth, aromatic bitters, and a luxardo cherry, and “The Juliet,” named after Kristina’s cat who passed away in 2018, with vodka, a Moscow mule splash, ginger beer, and lime juice. 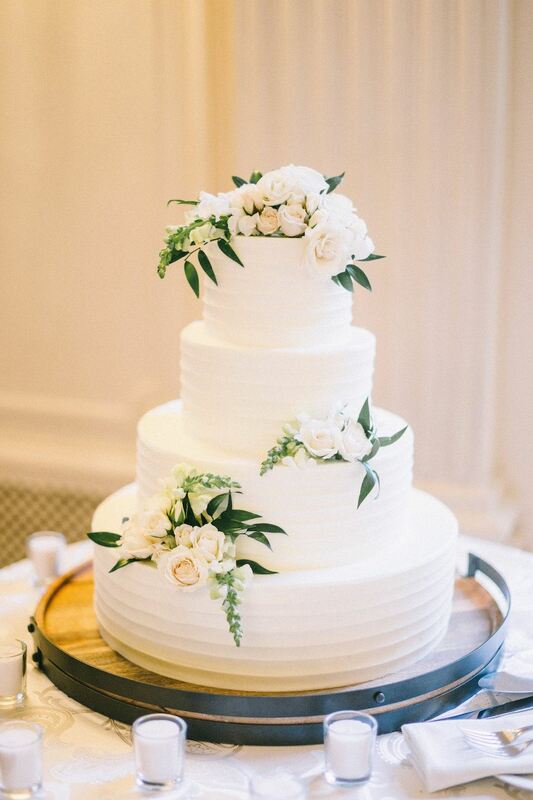 Montilio’s Baking Company created an elegant, flower-adorned cake for the couple that featured three flavors: strawberries and cream, pumpkin, and chocolate espresso. 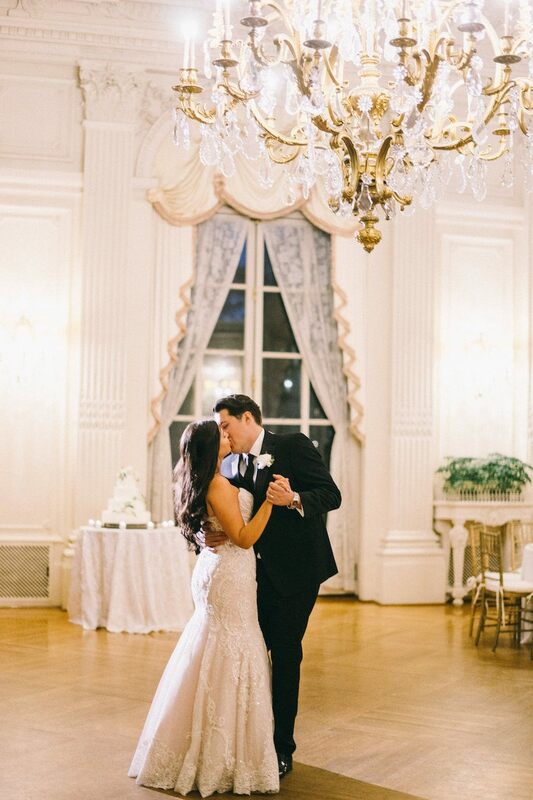 One of the couple’s favorite moments of the day? 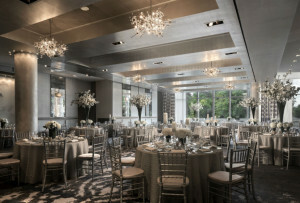 Their first dance, which they did privately in the ballroom while their guests enjoyed cocktail hour. The DJ played “Wild Animals” by Trampled by Turtles. “It was just the most romantic moment of my entire life,” Dan says.